Modern automobiles are built stronger and more efficient than vehicles made in the past. While many elements have been improved, damage to your windshield and glass can still happen at any time. A simple collision with another vehicle or animal can cause immediate glass damage. When damages happen, some residents do not know which repair company to call. PG Burbank auto glass repair has been the trusted choice for area residents for immediate service over the last 10 years. Sudden damage to your vehicle can be a confusing and stressful time. Not all damage happens on city roads and streets. Severe weather can quickly cause surface damage and cracks to your glass or windshield. Many parking lots are unattended and can be prone to vandalism of parked vehicles. If sudden damage happens to the glass on your vehicle, professional PG Burbank auto glass repair technicians can respond quickly and restore your glass to new condition. These professionals have the skills and experience to restore all auto glass. A small crack or hole that appears in your windshield can become a much larger problem if not restored quickly. A seemingly small crack reduces the strength of your windshield and leaves it vulnerable to more damage. Problems can worsen due to high heat and humidity. When severe damage happens, PG Burbank auto glass replacement specialists can arrive to remove your old windshield and install a new one. This replacement gives your automobile a completely new windshield that meets your auto manufacturer specifications. 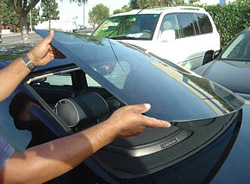 It is common during an automobile collision for no damage to appear on your windshield. The angle of the impact may break or crack side and back windows. These damages will prevent the ability to drive your vehicle correctly. The experienced PG Burbank car window replacement technicians that arrive to replace your broken windows provide free estimates before work is started. This ensures that you receive the lowest replacement and installation price. Residential, commercial and municipal vehicle owners rely on timely restoration and replacement to get back on the road quickly. Our technicians for auto glass replacement in Burbank are available 24/7 and will arrive at your place to replace the damaged glass with quality, brand-new glass. In case the damage is minor and repairable, our service vans for auto glass repair in Burbank carry the necessary equipments and our technicians will repair the damaged glass for you. Residents of Burbank, 91501, 91502, 91503, 91504, 91505, 91506, 91507, 91508, 91510, 91521, 91522, 91523 and 91526 can rely on PG Auto Glass for their auto glass repairs.